It was very early when I arrived in the Market Place at Newbury – just me, a couple of delightful streetcleaners in shiny new beeping machines and the local drunk on his way home…. or his way out, I wasn’t sure. Anyway, Sheree Monroe of New Beginnings Vintage Chic soon arrived and helped me to put my gazebo up then it was fast and furious until 10am when we opened to the public. 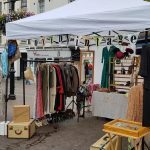 Sunday 9th September was the second day of Newbury’s 1940s event Their Legacy, Our History and Ruby’s was privileged to be providing the vintage market. We filled the square with some great stalls and enjoyed a busy day full of shoppers, dancers, cooking demonstrations and VIP visitors. We hope to be back in Newbury very soon! Our next event (and last one for this year) is at Hughenden Manor near High Wycombe for their 1940s weekend – we will be in the marquee on the front lawn.